First Scene: Kratakau Village, Pajaran Empire, West Java. January 1st, 1525. Well, we've made it to the opening scene. Feel free to email between yourselves, and indeed exclude people if you're having private conversations. However, make sure that you always send me a copy of correspondence. Keep in mind language differences. Keep in mind that this is primarily co-operative/contributive asynchronous storytelling - and is therefore quite different to many rpgs. I'll be moving the story along fairly quickly and as such yhe more if-then-else statements of intent you make to me the more input you'll have to the story's development. It wasn't the best of trading experiences for Macario de Arbuete and his crew. Assuming a relatively easy journey from Melakka, along the north coast to to the Spice Islands with a small fleet of other caravel's to pick up a cargo of pepper and cloves they encountered a surprisingly well armed group of pirates as they were staying overnight in the bustling port city of Banten. Normally such annoyances would be of little trouble to the well armed Portuguese merchant ship and sailors, but these people had firearms and cannon! Most unexpected. It was only the sharp thinking of the previously otherwise incorrigible Robert d'Aguilar that led to Macario escaping with his life and ship. Robert managed to wake his captain and escape to the harbour. The rest of the small crew were lost in the chaos. 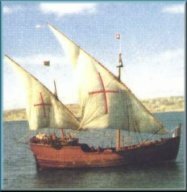 It took some insistence by Robert, but Macario decided to take advantage of the caravel's ability to sail into the wind and escaped to the west - and away from the wealth of the northen port towns and the spice islands. The decision probably saved his life (and the ship). With an effective crew of two and sailing into stormy headlong winds, Macario has managed to escape from the pirates. It has taken him the better part of three days to sail a mere seventy kilometers but excessive caution has been required. He's pretty sure that the pirates have moved onto more enticing locations. This morning, the ship has travelled between Java and and an island which includes what must be one of the largest volcanoes in the world! A peaceful looking village stretched along a golden beach is on the mainline, and the ship is obviously attracting some attention.